PLEASANTON, CA--(Marketwired - June 02, 2016) - Title21 Health Solutions (www.Title21Health.com), an innovative, Bay Area tech firm announced today that its Chief Executive Officer, Lynn Fischer, was chosen by Insights Success as the featured profile for their 50 Most Empowering Women in Business issue. Title21 Health Solutions is a woman-owned and operated business, delivering easy-to-use, flexible and integrated electronic data management solutions to support health science organizations to enhance quality, gain efficiencies and improve patient safety and outcomes. Title21 Health Solutions' customers include hospital labs, biotech firms, blood and marrow transplant programs and other organizations throughout the health sciences. 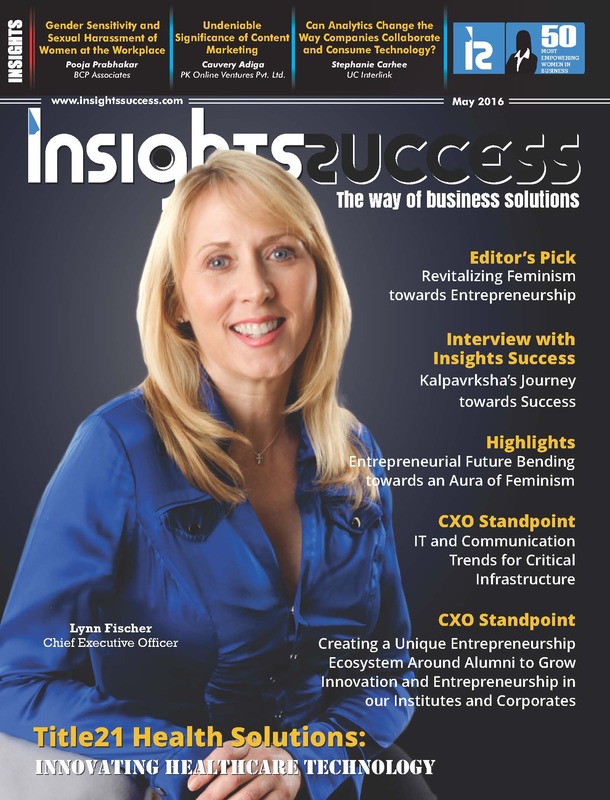 Insights Success is a technology-focused publication that features leading IT companies delivering effective and innovative solutions to strengthen market share. "When selecting the businesswoman for the main story of this issue, our criteria included a leader who is guiding the successful operations of a company whose products are making a meaningful impact to the customers they serve," stated Pooja M. Bansal, Editor-in-Chief of Insights Success. "We're delighted to share Ms. Fischer's key insights on success and leadership with our readers, as well as highlight the exciting innovations Title21 Health Solutions is bringing to the market." The issue, available today digitally and in print, highlights Fischer's strategic direction for Title21 Health Solutions which includes a continued focus on delivering solutions to enable interoperability, reduce medical errors, and provide accessible and highly secure technologies -- notably, in the rapidly expanding areas of regenerative medicine. Title21 Health Solutions has received much recognition for its solutions serving cellular therapy and biotechnology firms, including being named within CIOReview's Top 20 Most Promising Biotech Technology Solution Providers for two years in a row. The company's technology platform includes comprehensive quality management solutions as well as the Title21 Cellular Therapy Solution, which enables the complete electronic data management of a cellular therapy environment. "In the Bay Area, there is a high concentration of cutting-edge tech companies yet an under-representation of women in Senior Management," remarked Fischer. "I am grateful to lead Title21 Health Solutions as a woman-owned and operated company with a high-performing corporate culture and a team who is passionate about making a difference in healthcare and improving the lives of patients." Click here to read Insights Success' full article on Ms. Fischer.